Last season, former Haughton star Dak Prescott became a bona fide legend at Mississippi State when he came off the bench in the fourth quarter to lead the Bulldogs to a 17-10 overtime victory over rival Ole Miss in the Egg Bowl. Prescott, then a sophomore, was on the bench because of a nerve injury to his left (non-throwing) arm. He had sat out the previous two games because of the injury.He scored the winning TD on a 3-yard run on fourth-and-1. Prescott went on to be the MVP in the AutoZone Liberty Bowl as Mississippi State defeated Rice to finish the season 7-6. Because of that success, the expectations have soared for Prescott entering the 2014 season. He has been named to both the Maxwell and Davey O’Brien Awards Watch Lists. The Maxwell Award is given to the top football player in the country. The O’Brien Award goes to the top quarterback. Last year, Prescott started seven games while sharing quarterback duties with Tyler Russell, who was also out with injuries part of the season. Prescott scored 13 rushing touchdowns and broke the single-season record for rushing yards by a quarterback with 829 yards on 134 carries. He also completed 156 of 267 passes for 1,940 yards and 10 TDs. He dealt with a personal tragedy during the season when his mother died of cancer. Last spring, he found himself dealing with another difficult off-the-field situation when his high school head coach, Rodney Guin, suffered a heart attack. It was touch-and-go for Guin for awhile but he has recovered and is back coaching. Tuesday in Hoover, Prescott was asked about his relationships with Guin and Mississippi State head coach Dan Mullen. “Those are two great guys, “ he said. “I look at Coach Guin like a father. I just had dinner with him last night. Those are just two guys who expect a lot from me and push me every day. Starting with coach Guin, he knew what I could have and honestly I wouldn’t be at Mississippi State or be in college if it wasn’t for him taking me to all my camps during my senior summer. Mullen said Prescott’s biggest asset is his will to win. “I mean, he is a tremendous worker,” Mullen said Tuesday in Hoover. “He shows up every day, wants to outwork everybody, whether it’s in the weight room, conditioning, watching film, out at practice. He wants to be the first one out on the field, the last one to leave. He has that unbelievable work ethic. “That hasn’t slowed down. Had a good season last year, had success. He’s a guy that looks and is critical on himself of what he does well, what he does poorly, and he’s constantly working to improve his skill set. I know he has that will. He is big, strong, can lift, outwork you. He’s a guy that understands the importance of the skill of the quarterback position and he’s constantly working on his skill at that position. 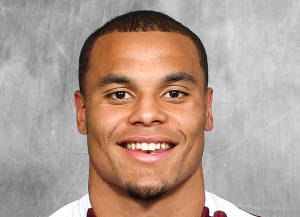 Prescott’s focus hasn’t been solely on football during his three years in Starkville. He has been nominated for the The Allstate AFCA Good Works Team, which recognizes student-athletes whose charitable involvement and community service contributions stand out. 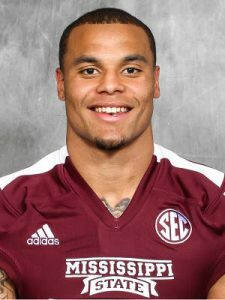 According to a Mississippi State press release, Prescott served as a bell ringer for the Salvation Army during the holiday season in Starkville and assisted with tornado relief efforts in Mississippi in May. He has also visited with patients at St. Jude Children’s Hospital in Memphis, Tenn., in December of 2013. Prescott said he has enjoyed his time in Starkville.